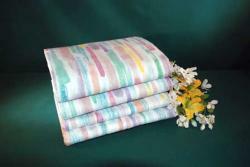 Printed Twin Sheets and Pillowcases Impression Stripe 50% Cotton 50% Polyester , No-Iron Finish .Order in full cases . Pillowcases 6 dz , Sheets 2 dz . All prices shown per Dozen .